In India, mythical legends associate themselves with the origin of a large number of states and Kerala too holds out the same affiliation. According to legends, Parsurama, the sage warrior, was responsible for the creation of Kerala. The story goes that Parsurama, enraged at the killing of his father at the hands of a Kshatriya king, vowed to eliminate entire Kshatriya clan 21 times. However, after completion of his vow, he was full of remorse and sort the advice of learned men to rectify his mistakes. These people asked him to distribute all lands he had acquired from the kings between the Brahmins. Parshuram had no objection as he willingly agreed to do the same and also sat in penance at Gokarnam, which at that point of time was considered the end of land. The sea god Varuna, pleased with Parsurama's dedication offered him land equivalent to the distance he could throw his axe. Parsurama threw his axe with full might from Gokarnam and it fell at Kanyakumari. The sea in this area receded and gave way to what is today known as Kerala. Post the Sangam era, Kerala plunged into a period of darkness which continued for the next four centuries. During this period, the Kalbharas ruled over Kerala. By the end of the eighth century, the Kulbharas were overpowered by the forces of the Pallavas, the Chalukyas, the Rashtrakutas and the Pandyas. It was during this period that the Second Chera dynasty, founded by Kulasekhara Alvar, rose to prominence with their capital in Mahodyapuram (present day Kodangallur). Kulasekhara Alvar was one of the 12 Alvars, Tamil saints who were responsible for propagating the Bhakti cult in South India. Kulasekhara Alvar was succeeded by Rajasekhara Varman Rul who is famed for the issuance of Vazhappali Inscription, the first epigraphical record of the Chera Kingdom. His successor, Sthanu Ravi Varman was on a cordial relation with the Chola King of the time, Aditya. However, after his demise, frequent conflicts between the Chera and Cholas resulted in the splitting up of the Chera Empire. Even their capital at Mahodyapuram was captured by the Cholas. During this period Calicut became more important. Ruled by the Zamorins (Lord of Sea) dynasty, Calicut shot into limelight as a major seaport. Trade with China and Arab took new dimensions and art and culture seemed to have got wings. The Zamorins also set about to expand their territory and conquered areas like Beypore, Parappanad, Vettat, Kurumbranad, Nilambur, Manjeri, Malappuram, Kottakal and Ponnai. However, the rulers of Cochin were not ready to be subjugated and hence frequent clash broke out between the two powers. With the advent of the Portuguese, things became difficult for the Zamorins as the former received support from the Cochin ruler. Tensions between the Portuguese and Calicut rulers lessened a lot after the arrival of Albuquerque (another Portuguese) but after his death, his successor could not manage the situation as well as him. This led to the decline of Portuguese power in Kerala yet they left behind a significant legacy of Portuguese culture. By this time, the possibility of great trading relations with India had attracted Dutch and Brithishers as well. Both these powers joined hand to break the Portuguese monopoly and they were successful to a large extent. But then, the rise of Travancore (Venad) ultimately saw the end of the Dutch power in India. Around 1763, Haider Ali, the ruler of Mysore captured the region of Kolathiri, Kottayam, Kadathanad, Kurumbranad and Calicut. By 1773, Haider Ali managed to extend his authority over Malabar as well as Trichur. His son, the famous Tipu Sultan, who succeeded him in 1782, also strengthened his empire and annexed the entire South Malabar region. In 1790s, when Tipu Sultan had barely managed to cross over the Travancore (Venad) territory, the third Mysore war broke out with the British. The kingdoms under Tipu began to bow to the pressures of the British power and he was forced to sign the treaty of Malabar. According to this treaty, Malabar region was given to the British. Under the British, the Malabar region was made into the district of Madras Presidency. Today, Kerala is one of the prime tourists destination of India and attracts millions of visitors every year. It is also known for its highest percentage of literacy in the entire country. was a Portuguese sea captain and explorer. He commanded the first fleet to reach India from Europe. Da Gama sailed around the Cape of Good Hope to India in the late 1490's. His voyage opened the first all-water trade route between Europe and Asia. 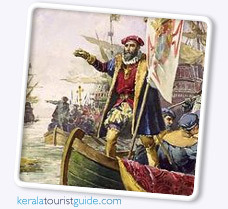 On May 20, 1498, da Gama reached Kappad near Calicut. In 1524, he was named the viceroy of India.